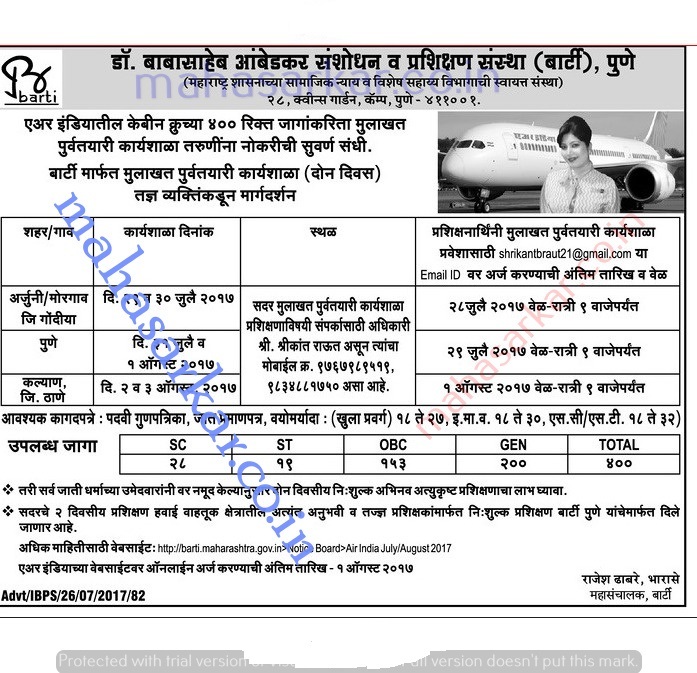 BARTI (Dr. Babasaheb Ambedkar Research and Training Institute), Pune Published Job Notification for 400 Cabin Crew Posts. Candidates who wish to apply must look at BARTI Cabin Crew Recruitment 2017. Eligible candidates can apply online before 01-08-2017 (01st August 2017). Education Qualification: Must be passed 10th, 12th, Graduation. For Post wise Education Details follow the detailed advertisement. Interested & Eligible candidates can apply online through the website https://barti.maharashtra.gov.in/ earlier than the due date. Starting Date, Last Date to Apply Online at Dr. Babasaheb Ambedkar Research and Training Institute which candidates should be remember as follows. Start Date to Apply Online: 26-07-2017. Last Date to Apply Online: 01-08-2017. Nagpur GK Current Affairs 2019 Nagpur History | Nagpur Geography | Nagpur Science | Nagpur Polity | Nagpur Economy | Nagpur Law etc.